Acquired: Selected in the seventh round (60th overall) of the 2015 CFL Draft. Signed to a contract extension on Feb 1, 2019. 2018: In 12 games, Smith finished with seven tackles, 13 special teams tackle and one interception. 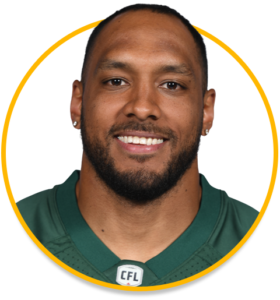 2017: In seven games, the Eskimos Special Teams Captain finished with four special teams tackles and five defensive tackles. Smith appeared in the West Semi-Final. In the West Final, Smith recorded two defensive tackles. 2016: In 15 games, Smith recorded four defensive tackles and 15 special teams tackles. He also added one forced fumble. Went on the 1-game injured list in Week 12, activated in Week 15. In the Eastern Semi-Final against Hamilton, he recorded one defensive tackle and one special teams tackle and in the Eastern Final against Ottawa he had one special teams tackle. 2015: Played in the all 18 games of the regular season, recording 19 special teams tackles. He recorded his first-career special teams tackle in Week 11 against Calgary. Smith recorded five tackles in the West Final and was on the active roster for the Grey Cup against Ottawa. College: Smith started out at New Mexico Military Institute where he recorded 48 tackles, one interception and one sack in one season. He then went on to Angelo State University where he tallied 59 tackles and three sacks in 10 starts in his junior season with one interception. In his senior season in 2014 he had 101 total tackles with two interceptions and two sacks.